The Wasp and Orchid Martial Arts Choreography Film Seminar returns! This month we’ll be kicking things off extravagantly with the fantastical ninja film Shinobi: Heart Under Blade (2005). Described as “Romeo and Juliet” meets “X-Men,” Shinobi tells the story of two lovers from rival ninja clans who have been at war with each other for over 400 years. These shinobi, living in seclusion far out in the wilderness, have developed their fighting abilities to a supernatural degree, each possessing their own particular skills. Although traditionally used as hired assassins by the ruling classes, they were also greatly feared for their power, prompting the current Lord to concoct a scheme pitting each clan’s best warriors against one another: a battle to the death in which the two lovers find themselves reluctantly caught. 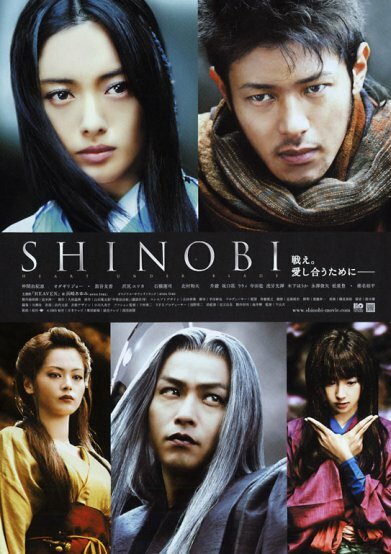 Shinobi was directed by Ten Shimoyama and features action director Yûji Shimomura (who is known for his work in video games as well as the horror movies Alive and Versus, the second of which will also be shown later on this year).